Look for the pink trucks! 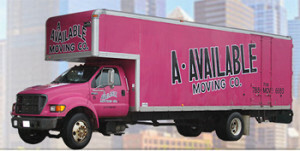 A Available Moving Company, Inc., is locally owned and operated by the Fries family in Berwyn, Illinois. Our company is licensed for intrastate moving by the Illinois Commerce Commission (Ill.C.C. 15961 MC). We've been moving families since 1961. A Available Moving Company, Inc., has been a member in good standing of the Illinois Movers' and Warehousemen's Association since 1961. 7:30 a.m. - 5:30 p.m., Monday through Friday. Saturday or Sunday moves at no additional charge. Residential, Office, and Commercial Moves in the Chicago area. Your furniture will be placed and set up to your specifications in your new home. Contact us today ... we're at your service!